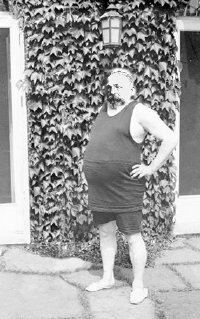 Holger Pedersen, standing poolside, shows off his imposing figure, the result of strict adherence to the latest diet trend—Phonemic Phoods—at the 1929 Annual International Men of Philology/Women of Anthropology Multidisciplinary Mixer, held at a private beach resort in Galveston, Texas. was soon attacked from linguistic circles. As an unfortunate consequence, gavagai recipes emanating from the Massachusetts Institute of Technology tend to be inedible. In most gavagai recipes quantities are vague, as is the exact nature of the meat to be used. Many recipes prescribe sundry undetached rabbit parts as a basic ingredient. The following is an exception. Season the detached rabbit parts and brown in a mixture of olive oil and butter. Add stock, a bay leaf and rosemary. Simmer gently for one hour, adding stock when necessary. Heat the remaining oil in another pan, add anchovies, garlic and vinegar. Cook gently for 15 minutes. Put everything together and simmer for another 5 minutes. W.V.O. Quine, Word and Object, MIT Press, Cambridge Mass., 1960.